What Are the Largest Lead Generation Niches? » What Are the Largest Lead Generation Niches? 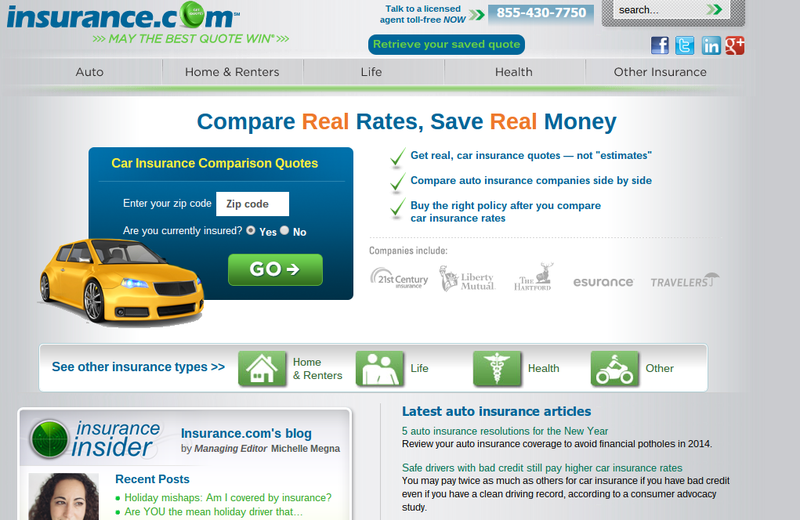 Insurance is probably the largest lead generation vertical. The products (e.g., an auto insurance policy) are largely commoditized, there are a number of interested buyers of leads, and there is minimal qualification that is required since just about everyone online is able to purchase insurance. A robust lead gen market has developed for more local service providers as well. This category is quite broad, but generally includes any professional who would be hired to do work within a home. 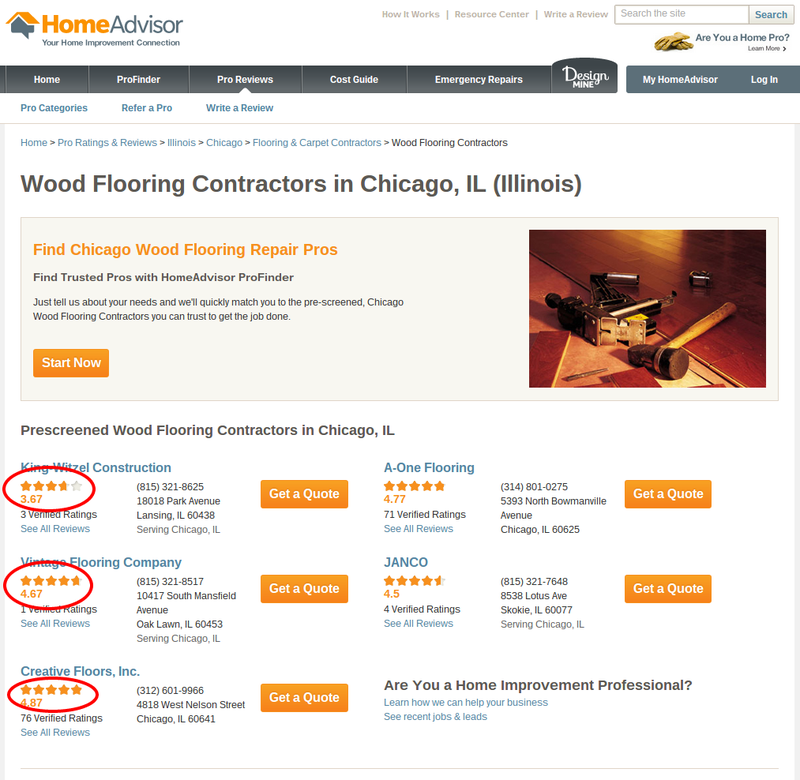 While many people will ask friends for recommendations, there is a lot of search traffic for home services as well. Remodeling and construction jobs are often quite profitable, meaning the companies looking for work can afford to pay a bit for a qualified lead. 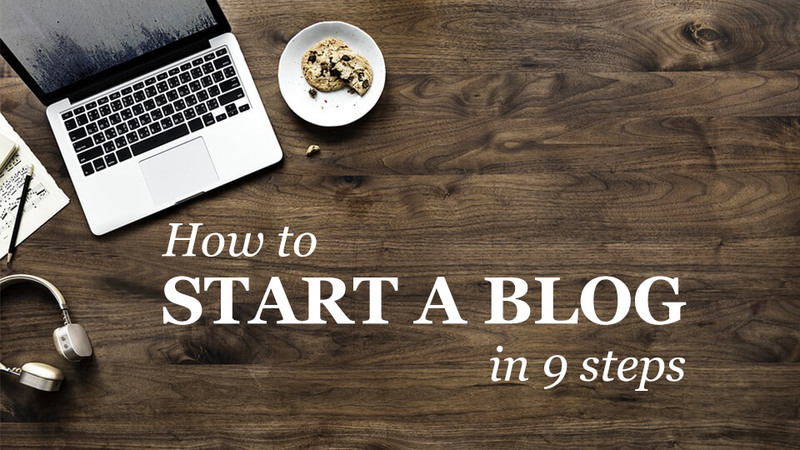 Moreover, because these companies tend to be small, local businesses they are somewhat limited in their marketing and advertising promotions. They’re not going to be buying national air time or running an ad in a national newspaper; these campaigns wouldn’t generate positive ROI. But spending a few bucks for a qualified lead is well within their budget, and more likely to result in a profitable job as well. The right leads can be worth a significant amount of money to lawyers; they can translate into hefty legal bills or even a percentage of any awarded damages in some cases. Obviously, the answers to all of these will help to determine the attractiveness of the lead. Someone with no previous convictions, no desire to fight the suspension, and no ability to pay for a lawyer isn’t all that interesting to a lawyer. 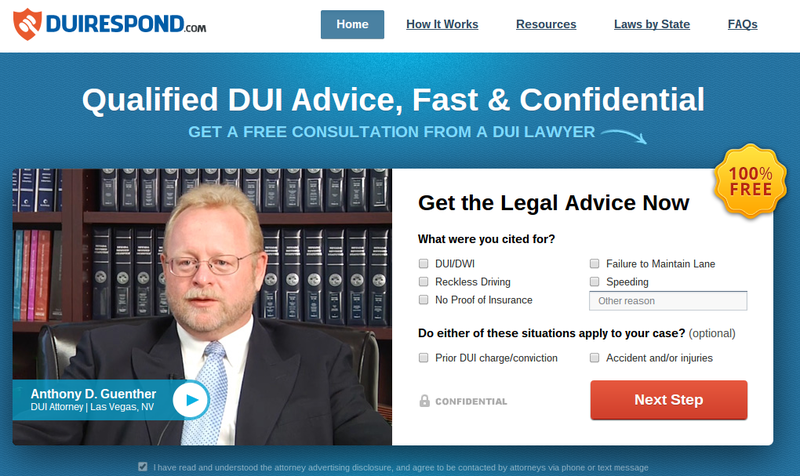 Conversely, someone charged with DUI who wants to fight a suspension, does not yet have a lawyer, and can pay for a lawyer with their personal savings could be a dream client for a DUI lawyer. As the online education industry has grown in recent years, so too has the lead gen business in this vertical. Online universities compete for potential new students, and there are a number of institutions who are willing to pay for contact information of individuals who have expressed an interest in pursuing an education online. Because this product is primarily delivered online, it should be no surprise that many potential students search for information about potential programs online. And although online colleges and universities are generally much cheaper than traditional institutions, a new enrolled student is still very valuable. With hundreds of online colleges now operating, there is no shortage of buyers for qualified leads. 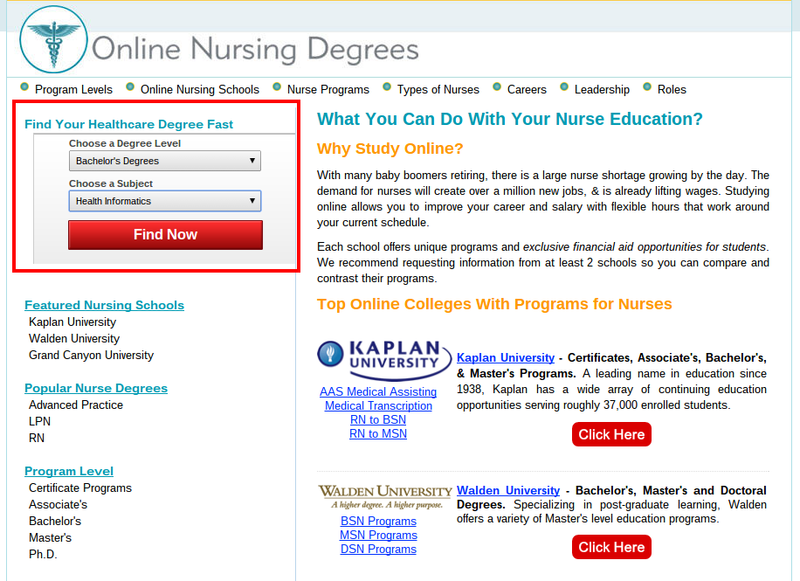 Below is an example of a site that comes up in a search for “online nursing programs”. 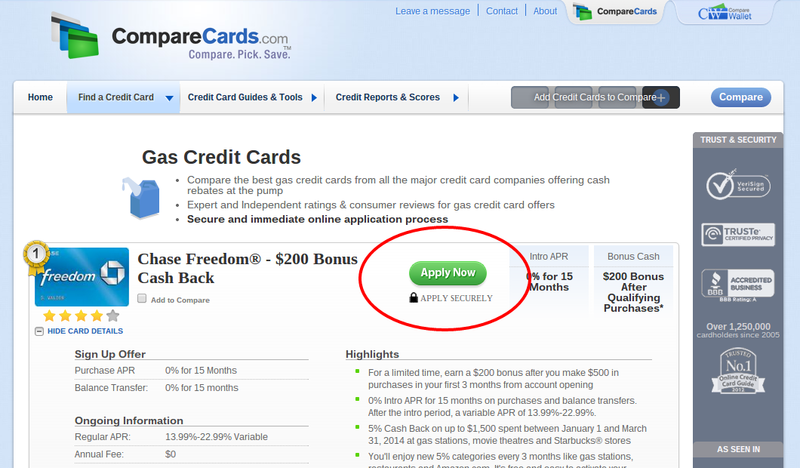 The credit card lead gen vertical is in many ways similar to the insurance vertical. The products, while numerous, are basically commoditized in that many companies offer similar cards. Moreover, the qualification hurdles are pretty low; a significant portion of the online demographic can qualify for some form of credit card. Unlike insurance, there is minimal upfront cost to the consumer, which means that every lead could relatively easily become a client. And a new client is relatively valuable to the credit card company, especially if they are able to gradually work them up to more expensive products. The mortgage and real estate vertical is another extremely active lead gen opportunity. While many will rely on personal recommendations to find a realtor or mortgage broker, there is also a significant amount of search traffic around this term as well. Moreover, because each new client in this vertical is worth a considerable amount of money to a realtor or mortgage broker, they can afford to pay quite a bit for a well-qualified lead. Mortgage and real estate lead gen also exhibits characteristics of affiliate marketing, in the sense that these sites will generally link out to third party partners for a form to be completed. Again, we consider this to be lead gen because the action in the Cost-per-Action (CPA) pricing model doesn’t generate any revenue for the purchaser of that lead. In fact, a relatively small percentage of visitors who complete a mortgage approval form ever end up acquiring a mortgage through the company that buys that lead. Those that do convert, however, can generate meaningful revenue. This vertical may seem a bit out of place on this list, but it’s a fast-growing lead gen segment and a good fit for a lead generation site. Converted leads are very valuable, as many care centers cost tens of thousands of dollars a year. And referrals from friends and families aren’t quite as easy to come by, which leads to decent search volumes for these types of services. And there are generally a number of interested lead buyers in any given area of the country, all offering generally similar services. Finally, because care providers and nursing homes cater to a very specific segment of the population, broad-based ad campaigns (such as TV and radio commercials) are unlikely to generate positive ROI. Those marketing dollars are better spent on qualified leads resulting from people actively searching out care options. 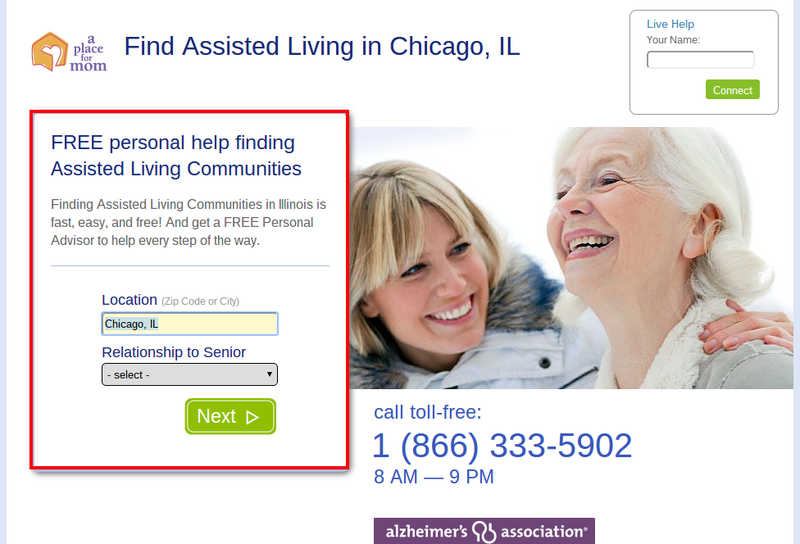 Below is an example of a site that comes up on a search for “assisted living Chicago”. Submitting this mini-widget prompts you for more information, including email and phone number. From there, the lead is presumably off to nursing homes in the area, and a phone call and email to the interested family member aren’t far behind. For more ideas on large and liquid lead generation niches, the websites of the largest lead aggregators can be useful resources. QuinStreet lists a handful of additional verticals (albeit somewhat broad ones) in which it is active. 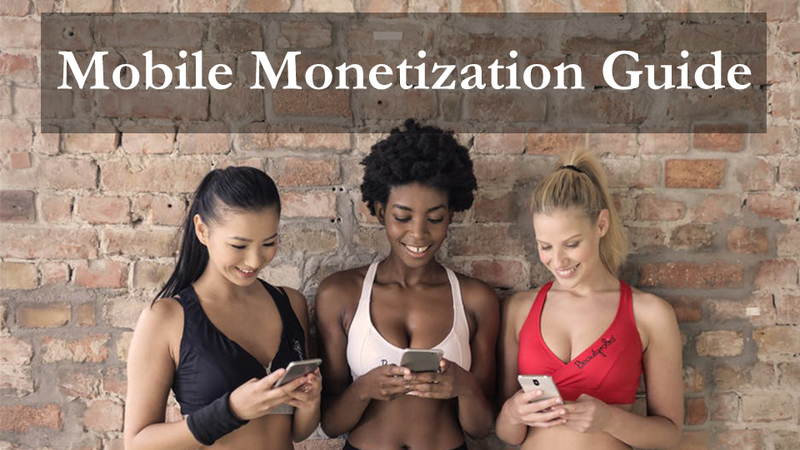 Lead generation as a monetization technique for online properties has countless appearances; there are hundreds of different verticals in which qualified leads can be monetized. The most popular niches are those in which buyers tend to be numerous and deep-pocketed (or in which the cost of the product or service is subsidized by a third, as is the case in legal and education) and in which the value of a converted lead is high. It’s worth noting that just because a niche is popular doesn’t necessarily make it appealing to someone looking to get into the game. There’s intense competition in all of the niches highlighted above, including from some well-funded and established players. While these verticals are extremely liquid, success is far from guaranteed. I have a few sites where I do lead generation, but none yet are these niches. This is a great article that gives me some wonderful ideas on what to develop next. Thank you! I am looking to getting into led gen myself. Thanks for the info. It is very much like affiliate marketing as well. I believe I will do well. Thanks! Craig, you can start with offervault. They have some of these lead offers and you can sort them by industry, cost per lead and their various affiliate networks. Great Article! I also enjoy lead gen type marketing and am focusing on home improvement at the moment. Busy cold mailing local companies and selling lead gen like that but I want a more secure, in terms of guaranteed payment, method. Do you know if the big CPA networks have these types of verticals?